March is fast approaching and many early childhood classrooms are gearing up for Read Across America Day/Dr. Seuss' birthday! We found this great quote board from Lindsey at The Teacher Wife while perusing some of our favorite teacher boards on Pinterest and thought we'd pass it along since it's one of our favorite Dr. Seuss quotes! This would look great in your classroom library, on a hallway bulletin board, or even as a door display! Background: Black bulletin board paper. Lindsey used word processing software and various fonts to create the words of the quote. She then printed them onto white paper and cut out each word to paste onto the display. Border: Solid black wavy trimmer or Dr. Seuss themed border. Decoration: Find a black and white clip art image of the Cat's hat, using your classroom projector system to enlarge and trace it onto a piece of white bulletin board paper. Use red craft paint where appropriate, coloring in the stripes on the hat, and when dry, use a black permanent marker to add an outline/detailing. Add 'candles' - made from colored construction paper or traced onto white bulletin board paper and colored - to the top of the cake in celebration of Dr. Seuss' birthday. For a fun addition to the board, invite your students to brainstorm what makes them unique. Have them write a short blurb - attaching this to a cutesy accent, adding a picture of the student, and arranging the colorful cutouts on the bulletin board around the hat cake. 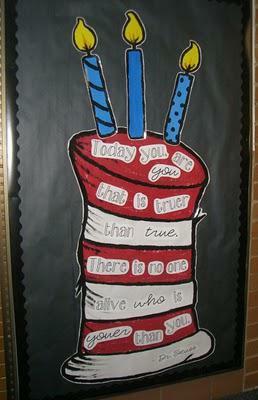 Dr. Seuss' quote celebrates the special qualities that make us who we are and set us apart. We think this could be a fabulous way of highlighting each child's uniqueness!